Author(s): Meihui Liu, Min Tang, Ming Li, Feng Gao, Can Shi, Jing Hou, Wenbin Zeng. School of Pharmaceutical Sciences, Central South University 172 Tongzipo Road, Changsha, China. As the ever more critical role of individualized therapy in the cancer treatment and management, circulating tumor cells (CTCs) have caught much attention for providing a promising way in metastases establishment, disease diagnosis and prognosis. Also, their presence has been generally considered as the rationale behind the application of systemic adjuvant chemotherapy. Therefore, CTCs open a new window for the clinical utility, especially for the diagnosis and evaluation of cancer, and move toward personalized medicine. In this review, we summarize the pros and cons of current available technologies for enrichment and detection of CTCs comprehensively. In addition, recent advances in the development of microfluidic and nanotechnology for isolation of CTCs are outlined. Furthermore, circulating tumor microemboli (CTM)-based and telomerase-based assays, the emerging methods for CTC detection and the application of CTCs in the clinic, have also been evaluated. Finally, perspectives and challenges of all these methods in the field of CTCs’ isolation and detection are presented. Keywords: Circulating tumor cells, disseminated tumor cells, enrichment, detection, circulating tumor microemboli, pros and cons, personalized medicine. Affiliation:School of Pharmaceutical Sciences, Central South University 172 Tongzipo Road, Changsha, China. Keywords:Circulating tumor cells, disseminated tumor cells, enrichment, detection, circulating tumor microemboli, pros and cons, personalized medicine. Abstract:As the ever more critical role of individualized therapy in the cancer treatment and management, circulating tumor cells (CTCs) have caught much attention for providing a promising way in metastases establishment, disease diagnosis and prognosis. Also, their presence has been generally considered as the rationale behind the application of systemic adjuvant chemotherapy. Therefore, CTCs open a new window for the clinical utility, especially for the diagnosis and evaluation of cancer, and move toward personalized medicine. 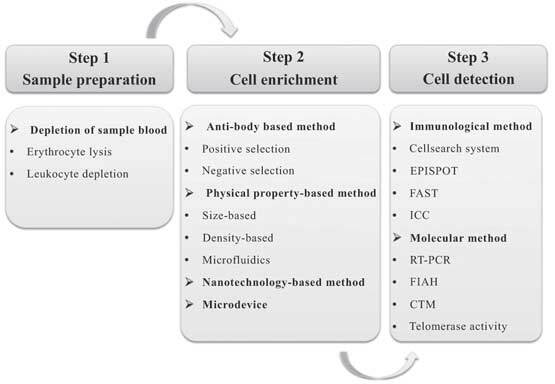 In this review, we summarize the pros and cons of current available technologies for enrichment and detection of CTCs comprehensively. In addition, recent advances in the development of microfluidic and nanotechnology for isolation of CTCs are outlined. Furthermore, circulating tumor microemboli (CTM)-based and telomerase-based assays, the emerging methods for CTC detection and the application of CTCs in the clinic, have also been evaluated. Finally, perspectives and challenges of all these methods in the field of CTCs’ isolation and detection are presented.